This guy thinks LBJ was the kingpin behind it. VERY PLAUSIBLE. But he believes that the fatal shot was from the book depository. I don't agree. 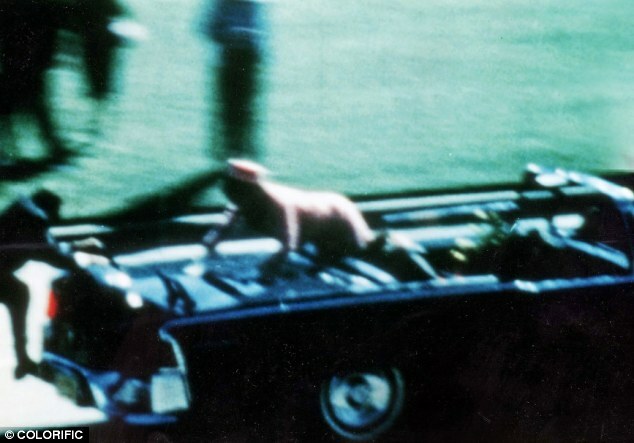 WASHINGTON, D.C. â€“ The Warren Commission, in its effort to portray Lee Harvey Oswald as the lone assassin of President John F. Kennedy, had to ignore or otherwise obfuscate abundant medical evidence and testimony that JFK suffered an exit wound in the back of his head. A front-entry wound in his body means that more than one shooter had to have been involved, as Oswaldâ€™s Texas School Book Depository building was behind JFKâ€™s limo when the shooting began. The remarkable series of frames in the Zapruder film shows a frantic Jackie Kennedy in the back seat propping her husband up to a full sitting position, as if he were alive. The sequence, rarely watched or studied, begins to be clearly seen around frame 456. In the instant after the fatal headshot, Jackie Kennedy reacted with the type of hysteria that some unfortunate victims experience who have lost an appendage or part of an appendage. Just as those victims will try to jam the severed appendage back in place, in the film Jackie scrambles onto the trunk of the limo trying to grab some part of JFKâ€™s skull or brain matter. another great video from Jeff Rense. ED HOFFMAN: "I suddenly saw two man who looked suspicious directly over there in the car park. I saw a man standing here (Ed Hoffman actualy is at the spot in the docu from where he saw pufs of smoke and a man behind the fence with a gun in his hand on the carpark behind the grassy knoll) wearing a blue hat and a black jacket. The man with the striped railroad shirt walked over to the electrical box with the gun. He took the gun apart. He put it in a toolbox. He then walks slowly away in the direction of the railroad track." GORDON ARNOLD: "On that particularly morning what happened was I came down town and I thought there was gonna be a parade. So, what I did is I parked my car back here at this parking lot and intentionally walked to this particular corner because I wanted to take pictures of the parade off of the railroad bridge. Well this is about how far I got cause what happened is when I got my leg to about this position (Gordon Arnold shows at the actual spot that day with one leg over a leg high iron fence) A man game around the corner off the bridge, had a suit on and he turned around and told me that I wasn't going to be there. And I quess I was more younger and spunkier at the time cause I told them: "You and who else ain't gonna keep me off the bridge" and he pulled out identificationcard and he said: "I am with the CIA" - and I said "Well that's enough muscle, I Ieave." So, I turened around and brought my leg back over like this (actually pulls back his leg from the one step over the fence position) and walked down the fence line here about half way and I was looking over the fence to see if good get a good shot of the parade he came back up and told me he says: " I told ya to get out of this area!" and I said "OK" so I walked the complete length of the fence, got around on the other side. That's when I started to line up my frame so that I could take the picture of the parade. I had been panning shots trough here so that I could get whatever was gonna come down that street, and I saw that it was the President of the United States. And as I was panning down this direction, just as I got about this position (Gordon Arnold shows with his hand the camera panning direction that day), a shot came right passed my left ear. And that meant, it would have come from this direction (Points with his left hand behind his left shoulder direction the parking lot which is right behind the wouden fence from which he's in front on the grassy knoll filming the parade). 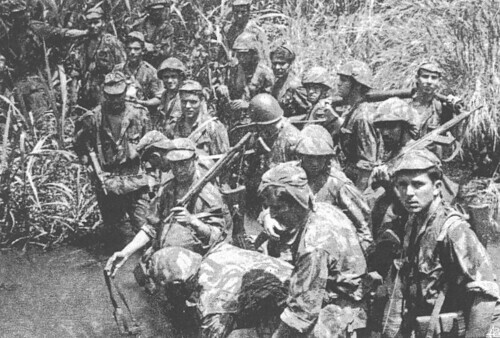 That's when I fell down and to me it seem a second shot was at least fired over my head, as bunch of report going on in this particular area at that time. And what happened was that, while I was laying on the ground, it seem like a gentleman came from this particular direction and I thought he was a police officer cause he had the uniform of a police officer. But he didn't wear a hat and he had dirty hands but that didn't realy matter much at that time because, with him crying like he was, and with him shaking when he had the weapon in his hand, I think I'd gave him almost anything except the camera cause that was my mothers. And litteraly what the man did was kick, kick me, and ask me if I was taking a picture. I told him that I was, and when I looked at the weapon it was about that big around (Gordon Arnold shows the size of a hand gun between his hands) I decided let them go ahead and and have the film. I gave it to him and than he went back off in this direction (Gordon Arnold points with his left arm half way behind him). I went off in this direction (Gordon Arnold points left with his left arm). And three days later I was on Alaska and I didn't come back to the United States for about 18 months." It was a epica we can't let go down the memory hole.. Honor, we were a true America. I didn't see a dry eye when he was murdered, the majority of Americans loved this President. It was the day- the music died. It's a damn shame the youth of today don't realy know the equality ,integrity ,the honor one felt knowing we were all a part of a better nation based on the law of this land and people. RFK to Johnson--- Why did you kill my brother? But as the 50th anniversary of the tragedy approaches Marina, now a 72-year old grandmother, has emerged from the shadows and is pictured in public for the first time in 25 years, shopping at her local Walmart. Long remarried and living in rural Texas just 20 miles from Dealey Plaza, where Kennedyâ€™s brains were blown out, Marina Oswald Porter is said to be in poor health and struggling to cope with international interest in the anniversary. Marina Oswald, formerly married to Lee Harvey Oswald, sold his wedding ring at auction Thursday. The ring played a key role in Oswald's emotional turmoil on the day of the JFK assassination in 1963. Lee Harvey Oswaldâ€™s wedding ring â€“ a haunting symbol of the tragedy of the assassination of President John F. Kennedy â€“ is among the hundreds of items of JFK memorabilia scheduled for auction in Boston on Thursday. The wedding ring sold for $90,000 on Thursday afternoon. Relatively recently, Oswald's widow, Marina Oswald Porter, recovered the ring, which apparently sat forgotten for decades in the files of a Fort Worth lawyer who once did work for her. Accompanying the ring is a five-page handwritten letter dated May 5, 2013, in which Porter writes: "At this time of my life I don't wish to have Lee's ring in my possession because symbolically I want to let go of my past that is connecting with Nov. 22, 1963." At her request, the auction house did not release the full contents of the letter, in which Porter documents the history of the ring â€” from its purchase in the Soviet city of Minsk, Belarus, before their April, 30, 1961, wedding, to being left on the dresser at her friend Ruth Paine's home, where she and their children were living when Kennedy was killed. With the 50th anniversary of Kennedy's assassination coming up in November, the auction house gathered items ranging from Kennedy's personal belongings to Oswald's Marine Corps rifle score book, which sold for $54,000. Another auction item, the sixth-floor window from the school book depository believed to have served as Oswald's sniper perch, did not sell. The window was removed weeks after the assassination. I don't think many people believe that Oswald shot Kennedy. Steve Douchee (not sure of spelling) of FOX news in the 1st video on the thread thinks Oswald did it OR DOUCHEE IS PLAYING A GAME. The MSM is still playing the OSWALD SHOT KENNEDY GAME. Col. Craig Roberts--has been on the AJ Show many times---said he went to the place where Oswald was said to have shot the old Russian rifle. He said he couldn't have made the shots and Roberts was an EXPERT MARKSMAN in the military. As long as the power structure responsible for the assassination is still in place, so will the truth of it will remain suppressed. TRUE. But the plethora of books out there, IMO, are more correct than the Warren Commission Concocted Findings. The President's Commission on the Assassination of President Kennedy, known unofficially as The Warren Commission, was established on November 29, 1963, by Lyndon B. Johnson to investigate the assassination of U.S. President John F. Kennedy on November 22, 1963. It concluded that Lee Harvey Oswald acted alone in the killing of Kennedy. The Commission's findings have since proven extremely controversial and have frequently been challenged. Upon its release in 1964, all files of the Warren Commission were sealed from public view for 75 years (until 2039) by executive order of President Johnson. According to the Assassination Records Review Board, Kennedy assassination related documents that have not been destroyed are scheduled to be released to the public by 2017. The United States House of Representatives Select Committee on Assassinations (HSCA) was established in 1976 to investigate the assassinations of John F. Kennedy and Martin Luther King, Jr. The Committee investigated until 1978 and issued its final report, and concluded that Kennedy was very likely assassinated as a result of a conspiracy. However, the Committee noted that it believed that the conspiracy did not include the governments of the Soviet Union or Cuba. The Committee also stated it did not believe the conspiracy was organized by any organized crime group, nor any anti-Castro group, but that it could not rule out individual members of any of these two groups acting together. In 1992, Congress passed legislation to collect and open up all the evidence relating to Kennedy's death, and created the Assassination Records Review Board to further that goal. The Church Committee was the United States Senate Select Committee to Study Governmental Operations with Respect to Intelligence Activities, a U.S. Senate committee chaired by Senator Frank Church (D-ID) in 1975. A precursor to the U.S. Senate Select Committee on Intelligence, the committee investigated intelligence gathering for illegality by the Central Intelligence Agency (CIA), National Security Agency (NSA) and Federal Bureau of Investigation (FBI) after certain activities had been revealed by the Watergate affair. They want to release the files of the Warren Commission in 2039 because most of us that were alive at the time of the assassination WILL BE DEAD OR OVER MEDICATED AND WE WONT GIVE A DARN. I will be 86 yrs old in 2039 and hopefully have kicked the bucket. I was in the 5th grade in 1963. Nero and Rome burning was a big deal for a couple of years. Same with all "catalyzing events." That why powerful people like them so much. What the young don't realize is that we aren't seeing anything new. JFK was assasinated by the elite ,syndicate, it was a criminaly organized inside operation, we know it and so have any Any American and foriegners with a drop of common sense. It was and continues to be a disqrace of our US goverment and those folks who simply went along through these years. JFK was the hope for Americans, freedoms, equality and rights. The rats had to take him out, as did they his brother and MLK. Gamblers, high state scumbags were taking bets on the day JFK would be assassinated after he took on the FED and was beggining to stop the war in Nam. The reality, some people know what is going on, others accept the fables and pretend to go along , the easy path. Untill the people openly become pizzed off and recognize the criminals in power, we will be controlled. After JFK was murdered, well lets see a few incidents, the FED was fully reinstated, the Gulf of Tonkin FF, Vietnam implded-3 million Vietanese killed, 60,000 GI's, the SS Liberty attacked by Israel, Bosnia, 911, Afghanistan invasion and occupation, Gitmo, torture, Iraqs nonexistant WMD's, Lybia, and more, and more..AJ among others has been right, as have many other men with integrity..
JFK he was a man of soul for our people and nation, A true American. STAND UP AND LET THEIR SOULS SHINE. I have never seen this video mentioned by the main stream media.Probably because it`s indefensible.Yet 5 million views on youtube. Watch as the two secret service men assigned to protect president Kennedy's motorcade are ordered to stand down just minutes before entering Dealey Plaza. It was just before Thanksgiving in the year 1963 ... November 22, to be exact. It was sunny but cool at Minor High School that day. I was fifteen, a sophomore. I was in sixth period Phys Ed along with all the other tenth grade boys, in the gym. My group was on the mats, tumbling. â€œOK. At the whistle. Simms, Todd and Rubino. Start it off ..... ,â€� he barked, then the whistle blast. I was seventh or eighth in line one, behind Leslie Newton. â€œI hate this crap,â€� I whispered to him. â€œI heard weâ€™re starting Ball Room dancing with the girls soon. Now THAT I can get into!â€� I said. A pudgy guy in line two was hung up on hand-walking ... it was becoming a race between us and line three. â€œBombs away!â€� yelled Les, as he plunked down on his back, rocked back on his shoulders and kipped up into perfect upright position. He was in his hand stand when the intercom crackled on. The deep, firm voice of our principal, Mr. Graham said, â€œGive me your attention, please. Students, this is an emergency, however, there is no danger. All teachers and students please go to your homerooms immediately. There will be a very important announcement at 2 oâ€™clock.â€� He sounded ... I donâ€™t know ... distressed. Tony, Eli, Les and myself were all in Mrs. Hocuttâ€™s homeroom. She taught 10th and 11th grade History with an iron fist, and conducted homeroom with a definite Eva Braun flair. She was about forty-five, stocky, clunky shoes, severe hair and she favored long skirts, starched tops and short jackets. When we walked in, there were ten or twelve other students at their desks and Mrs. Hocutt was at her seat, elbows on the desk, head in hands, sobbing quietly. We took our seats and waited ... expectantly, as the classroom filled up. Mrs. Hocutt looked up, tissue to her face, trying to compose herself. It was almost two oâ€™clock. Huh? What did he say? I looked over at Tony, then Eli. Les was slumping in his chair, his hand over his mouth. My tears were starting to flow ... my ears were ringing ... my tongue felt huge ... Mrs. Hocutt was weeping uncontrollably ... a girl just in front of me fainted, her head flat on her desk. â€œ... suspended for the remainder of the day and until further notice. Teachers, please bring your classes single file through the western entrance into the auditorium for assembly. Buses will run as normal,â€� and his mic clicked off. Mrs. Hocutt, attending to the fainted girl, stood erect, and gazed a lightning bolt straight at Harley across the room. She walked very deliberately over to his desk and said, â€œStand up,â€� which he did. She let fly a roundhouse open hand slap to his face. He staggered back a bit. â€œGet out of my class right now,â€� she said between clenched teeth and pointed toward the door, â€œ.... and donâ€™t come back.â€� That was the last I ever saw of him. In the assembly Mr. Graham told us that he was not sure when, â€œ ... school would re-convene,â€� that it was time to be with our families, to mourn. We prayed. The little black and white TV was set up with a mic onstage and we listened to Cronkiteâ€™s account. I was sitting next to Les. â€œWhy President Kennedy? Whatâ€™s gonna happen, Jackie?â€� he asked, not really expecting an answer. Remembering something my Dad had told me, I returned, â€œHe thought he was in charge ... but he wasnâ€™t ... and they killed America today,â€� and I was right ... that is exactly what happened. Holly's quote: "The day they killed America!" They lined em up, JFK,RFK,MLK.. Honorable men knowingly put their lives at risk for us, the dark side took the throne. Chris â€¦ what are your memories of that day? I was in the 5th grade. I remember the janitor coming in and telling us that the president had been shot. A little while later he came back in and said that President Kennedy is dead. I remember the boys discussing the Nebraska-Oklahoma football game at recess but we did not talk about the president being killed. We played marbles and some were trading baseball cards. On Saturday I remember holding my transistor to my ear listening to the Nebraska-Oklahoma game. The next morning I was watching the news and they had special coverage of Oswald being transported and that's when Ruby shot Oswald on live TV. THAT'S WHEN IT HIT ME THAT THE JFK ASSASSINATION WAS A BIG DEAL. SHORT CHRONOLOGICAL TIMELINE OF HAPPENED THAT WEEKEND. 11:10 a.m. -- After staying overnight in Fort Worth, Kennedy leaves Carswell AFB onboard Air Force One to fly to Love Field in Dallas. 11:30 a.m. -- The presidential motorcade leaves Love Field. 11:30 a.m.-12:30 p.m. -- The motorcade follows a route through Dallas, during which the president stops the car several times to talk to citizens who approach his limousine. 12:30 p.m. -- President Kennedy is shot and taken to Parkland Hospital in Dallas. 1:00 p.m. -- President Kennedy is pronounced dead at Parkland Hospital. 1:08 p.m. -- Officer J.D. Tippit calls in to the police dispatch. By 1:16 p.m., he is dead. 1:22 p.m. -- A rifle is found on the sixth floor of the Texas School Book Depository building. 1:55 p.m. -- Lee Harvey Oswald is arrested at the Texas Theater in Oak Cliff for the murder of Officer Tippit. 2:04 p.m. -- John F. Kennedy's body leaves Parkland Hospital and is taken to Love Field to be carried to Washington, D.C. on board Air Force One. 2:25 p.m. -- Lee Harvey Oswald is interrogated for more than an hour and a half, taken to a lineup, interrogated for another hour and forty-five minutes, taken to another lineup, then a third lineup, then interrogated again. At 11:00 p.m., there is a fourth interrogation by an FBI agent. 7:05 p.m. -- Oswald is charged with the murder of Officer Tippit. 11:26 p.m. -- Oswald is charged with the murder of President Kennedy. 10:30 a.m. -- A fourth interrogation lasts for two hours and forty minutes. 1:10 p.m. -- During the day, Oswald speaks with family and friends. 5:30 p.m. -- Oswald speaks to H. Louis Nichols, President of the Dallas Bar Association, for five minutes. 9:30 a.m. -- A fifth interrogation. 11:21 a.m. -- Jack Ruby shoots Oswald during a transfer from the Dallas Police Department to the County Jail. Jack Ruby died in prison on Mar 1, 1967. 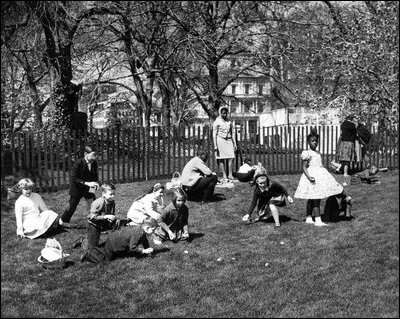 Me with my two sisters (left-center) rolling easter eggs. I'm on one knee. We saw John-John and Caroline. I am 1 year older then Caroline. 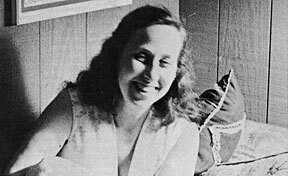 Mary Ferrell was a woman of rare ability, regarded internationally as one of the most knowledgeable and respected historical researchers of the assassination of John F. Kennedy. She aided many authors and other researchers in their work, and compiled a vast name database and a detailed set of chronologies. Her skills as an investigator and historian were matched by her ability to educate and stimulate those around her. This website is devoted to carrying on her work and spirit. On November 22, 1963 Mary was at work in downtown Dallas. Upon hearing the news of the assassination of President Kennedy, Mary thought the crime would be difficult to solve, and was astounded when the police arrested a man, Lee Harvey Oswald, hardly more than an hour later. Mary had three teenaged sons at home, and she told her husband Buck to place one boy at the loading dock of both papers in Dallas to get a copy of each edition that weekend. Mary and her boys obtained a complete set of all the editions of the Dallas papers from that weekend, and thus began what turned into a legendary collection of books, newspapers, magazines, reports, and declassified documents, now held by the Mary Ferrell Foundation. Mary Ferrell died in 2004 at the age of 81. One of many previously secret JFK assassination documents (see larger 1980-era withheld page, and as released in 1997). A Congressional Investigation from 1976-1979 found a "probable conspiracy" in the assassination of John F. Kennedy and recommended the Justice Department investigate further. As of 1991, the Justice Department has done nothing. The files of the House Select Committee on Assassinations are locked away until the year 2029. 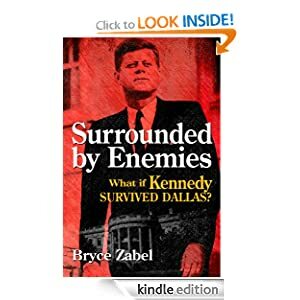 Complacent Beverly Hills housewife Mae Brussell had quite an awakening in 1963 when President Kennedy was assassinated, and again when she read and cross-indexed the massive 26-volume Warren Commission Hearings. She saw that the international terrorist network that had made up the Axis powers during World War Two had gone underground and continued their world-wide fascist campaign, overthrowing one country after another. America was not exempt. Mae Brussell, the Carmel Valley conspiracy theorist who sometimes faced death threats because of her work, died from cancer Monday afternoon in Carmel Convalescent Hospital. Mrs. Brussell, 66, had been in the convalescent hospital about three weeks. She was widely known as a writer, radio commentator, lecturer and researcher of a premise that the United States is secretly run by powerful groups that will stop at nothing to maintain control. Mrs. Brussell started her conspiracy research and presentations after President John F. Kennedy was assassinated in 1963. "It started the day Kennedy died," her daughter, Barbara Brussell, said last night. "She thought something looked fishy, especially when (Lee Harvey) Oswald was shot." In the 26 years that have followed, Mrs. Brussell amassed enough reports, news clippings and notes on the Kennedy assassination and other events to fill 39 four-drawer filing cabinets, said John Judge, who has taken over her library to set up the Mae Brussell Research Center in Santa Cruz. She taught an accredited course in conspiracy at Monterey Peninsula College in the mid-1970s and wrote for such publications as The Realist, The Rebel, People's Almanac, The Berkeley Barb, Penthouse and Hustler. 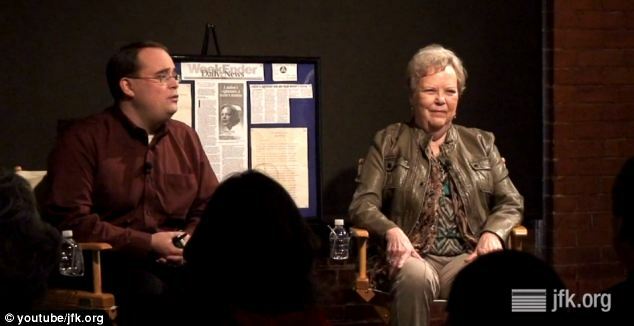 Mrs. Brussell's controversial radio show, "World Watchers International," was on the air for 17 yearsâ€”851 weekly editions. It originated with KLRB in Carmel, then listener-supported KAZU in Pacific Grove, and was sent on to a half-dozen other radio stations. Mrs. Brussell gave up the weekly show this March, after she reported a death threat from a listener who telephoned her home. In the mid-1970s, Mrs. Brussell reported a death threat from a Charles Manson follower. She had alleged in a radio broadcast that the Manson Family was working with the Los Angeles Sheriff's Department to commit mass murders. "I've never really pushed any of my ideas. I've just gone about my research slowly and steadily, but after Watergate I found a lot more people were listening to me." One friend in Pacific Grove, Bette Phillips, said Mrs. Brussell was perceived as "far out" by some, but she was careful to publicize only what she could prove. "She was a tremendous person and a true patriot," Ms. Phillips said. "Mae loved her country and she didn't like some of the things that were happening to it." Mrs. Brussell lived in Carmel Valley for 23 years. She was born in Los Angeles on May 29, 1922. Her father, Edgar Magnin, was a noted rabbi in Los Angeles. Her great-grandfather, Isaac Magnin, founded the I. Magnin clothing store. Mrs. Brussell is survived by two sons, David Goodwin and John Goodwin, both of Los Angeles; two daughters, Barbara Brussell of Los Angeles and Kyenne Brussell of San Francisco; and a brother, Henry Magnin of Los Angeles. Another daughter, Bonnie Brussell, died in a car wreck in 1970. Visitation has been scheduled from 2 p.m. to 9 p.m. Thursday in the El Estero Chapel of Mission Mortuary. A graveside service will be held at noon Friday in Monterey City Cemetery. 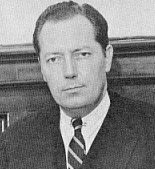 The real Jim Garrison, D.A. of New Orleans in the Sixties. The only person to prosecute someone for the hideous crime of assassinating the president. Five decades after President John F. Kennedy was fatally shot and long after official inquiries ended, thousands of pages of investigative documents remain withheld from public view. The contents of these files are partially known â€” and intriguing â€” and conspiracy buffs are not the only ones seeking to open them for a closer look. Some serious researchers believe the off-limits files could shed valuable new light on nagging mysteries of the assassination â€” including what U.S. intelligence agencies knew about accused assassin Lee Harvey Oswald before Nov. 22, 1963. It turns out that several hundred of the still-classified pages concern a deceased CIA agent, George Joannides, whose activities just before the assassination â€” and, fascinatingly, during a government investigation years later â€” have tantalized researchers for years. "This is not about conspiracy, this is about transparency," said Jefferson Morley, a former Washington Post reporter and author embroiled in a decade-long lawsuit against the CIA, seeking release of the closed documents. "I think the CIA should obey the law. I don't think most people think that's a crazy idea." Morley's effort has been joined by others, including G. Robert Blakey, chief counsel for a House investigation into the JFK assassination in the 1970s. But so far, the Joannides files and thousands more pages primarily from the CIA remain off-limits at a National Archives center in College Park, Md. It was a three-ring circus. A flamboyant district attorney, with visions of conspiracy, proposing a series of theories, most of them bizarre. What he first called a "homosexual thrill killing" evolved, under the influence of the conspiracy buffs who flocked to New Orleans, into a massive CIA and federal government plot. When push came to shove in the courtroom, a jury took less than an hour to acquit Clay Shaw, the man Garrison put on trial. 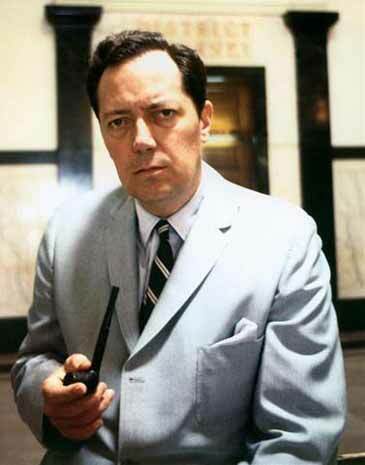 Jim Garrison, who as District Attorney in New Orleans made startling assertions of a widespread conspiracy and cover-up in President John F. Kennedy's assassination, died yesterday at his home in New Orleans. He was 70 years old. The New Orleans coroner, Dr. Frank Minyard, a longtime friend, said the exact cause of death would be determined in a routine autopsy today. Mr. Garrison had been bedridden with heart disease. His widely disputed accusations, which were revived in the recent hit film "J.F.K.," drew worldwide attention when he first made them in 1967. He asserted that Lee Harvey Oswald, whom the Warren Commission identified as the lone assassin in the President's 1963 death, was not the killer and had "never fired a shot." Announcing that he had "solved the assassination," Mr. Garrison accused anti-Communist and anti-Castro extremists in the Central Intelligence Agency of plotting the President's death to thwart an easing of tension with the Soviet Union and Cuba, and to prevent a retreat from Vietnam. It is my hope that they can release these documents before I'm an old man but I doubt it. Oliver Stone's JFK film is a great film to watch at this time. How Accurate is Oliver Stoneâ€™s JFK? I was in my last year of high school, the teacher was rattling along about names and dates, historical garble that didn't amount to a hill of beans. The teacher was an empty plate. I was in a state of shock, I remember looking at my favorite gal in the class, her head was bobbing and tears were flowing, she had cupped her hand over her mouth in what looked to be an attempt to control herself, I remained numb and felt as if I had been punched in the stomach.., wide eyed looking around, there was not a dry eye, some students had thrown their text books on the floor. The teacher had turned his back to us and his shoulders were shaking. School was dismissed, it wasn't until we had left and listened to the radio we realized he had been assassinated. I was trying to calm down the Lil miss I was dating that's when I broke down as well and shed tears. The day the music died..
LBJ's & the NWO took the throne.. The news media was on this for days, they caught the lone gunmen communist who shot JFK from the Dallas book depositary. Of course then they had a Mafia bottom feeder kill him (on the telly), he then died in jail from unknown causes before he could be transferred to a different prison and give testimony. Within that same space of time many doubts began as to how Oswald pulled it off, by the end of the same year it was fairly well accepted by folks with an average IQ, Oswald was not the hitter. The Warren commission were sucklings and many were aware of this. it in the early afternoon @ school. Totally a life-changer, no doubt. A nurse who was part of desperate attempts to save the life of President John F Kennedy after he was assassinated has claimed he was shot by a 'mystery bullet'. She described the bullet in an interview with the Sunday Mirror, which she said looked completely undamaged, and bore no resemblance whatsoever to bullets later shown as evidence in investigations into the President's murder. Glancing at her watch, nurse Phyllis Hall couldnâ€™t help thinking how the warm autumn day was beginning to drag. The Parklands Hospital outpatient department in Dallas was quieter than normal as most of the people she would normally have seen had gone into the city to see the President. Making the most of the unusual quiet moment almost 50 years ago â€“ on November 22, 1963 â€“ Phyllis went along to see a friend working in triage. But as the two nurses chatted, the peace of the emergency room was suddenly shattered by the harrowing screams of Texan Governor John Connally. 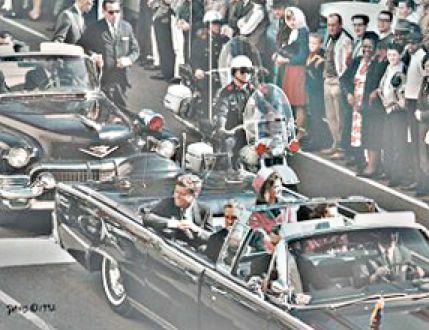 Six minutes earlier, he had been happily waving at the crowds, a passenger in the same car as President John F Kennedy. But as the motorcade swept past a grassy knoll, three shots were fired, fatally wounding the President and badly injuring Governor Connally. The two men were rushed to the Parklands Emergency and Trauma department where bewildered staff had no idea what had just taken place five miles away. Phyllis, then 28, recalls: â€œThe doors just exploded. At first we thought it was a woman being brought in who had gone into labour in the car park or even a bad car accident. â€œIt was only when I saw the mayor and Vice President Lyndon Johnson did we know something was gravely wrong. â€œJohnson looked grey. We thought he was having a heart attack. Then all of sudden the screams got louder and louder. â€œGovernor Connally was crying in pain. It was like nothing I had ever heard before. As surgeons rushed to his aid, the doors suddenly flung open again and Phyllis saw Jackie Kennedy running alongside a trolley carrying her husband. â€œI recognised her straight away,â€� says mum-of-three Phyllis. Phyllis, who had graduated as a nurse six years earlier, was then unwittingly thrust into Trauma Room 1, where a team of specialists had descended to try to resuscitate the President. â€œI wasnâ€™t supposed to be there,â€� she says. â€œIt was only because I had been speaking to my friend in triage. I heard this guy on Dr. Stan this past week. He has been writing on the JFK murder for decades. Check out his work. He too believes the OFFICIAL STORY is hogwash! Yet, the OFFICIAL STORY will be pushed by the psychopaths and their minions in Dallas, once again at the 50th Anniversary events! Jesse V. was being interviewed by 4 woman. Forget the name of the show, but when he mentioned the JFK assassination, one of the young woman giggled and said," Come on that's old stuff-"
Either people know the truth, play the game as if all is well, ignore it or simply don't have a mucken idea what they can do about it. I use to call the hideouts (Bubble people). Ya know,- they live in a safe bubble & whatever you do don't burst their LIL bubble. It is much simpler for deniers to toss stones at truthers and wiggle the OLE flag..
An old friend of mine, (he had been around the block a few times), use to say-" They run from reality and live in their LIL Abba Daba land. The NWO syndicate had to get rid of JFK to insure their goal, one century has passed since the inception of their grand plan..
Madeleine Duncan Brown (1925-2002). Mistress of "Lyin" Lyndon. When a world leaders is assassinated, the first question should be: WHO GAINS THE MOST. In this case, Johnson gained the most by becoming President. On Thursday night, Nov. 21, 1963, the last evening prior to Camelot's demise, I attended a social at Clint Murchison's home. It was my understanding that the event was scheduled as a tribute honoring his long time friend, J. Edgar Hoover, whom Murchison had first met decades earlier through President William Howard Taft, and Hoover's companion and assistant, Clyde Tolson. The impressive guest list included John J. McCloy, Richard Nixon, George Brown, R.L. Thornton, H.L. Hunt, and a host of others from the 8F group. The jovial party was just breaking up when Lyndon made an unscheduled visit. I was most surprised by his appearance, since Jesse had not mentioned anything about Lyndon's coming to Clint's. With Lyndon's hectic schedule, I never dreamed he could attend the big party. After all, he had arrived in Dallas on Tuesday to attend the Pepsi-Cola convention. Tension filled the room upon his arrival. The group immediately went behind closed doors. A short time later Lyndon, anxious and red-faced, reappeared. I knew how secretively Lyndon operated. Therefore, I said nothing ... not even that I was happy to see him. Squeezing my hand so hard it felt crushed from the pressure, he spoke with a grating whisperâ€”a quiet growl into my ear not a love message, but one I'll always remember: "After tomorrow those goddamn Kennedys will never embarrass me againâ€”that's no threatâ€”that's a promise." I visibly trembled. He said nothing else, but was off in a flash to join a party at Pat Kirkwood's "Cellar Door," an after-hours night club in Fort Worth. (Madeleine Brown, Texas in the Morning, p. 166). Geraldo Rivera Yesterday on Fox was essentially saying there is no evidence that JFK was kill by anyone else other than a lone gunman. When Alex interviewed him a few weeks ago I thought maybe there was hope for him, but now it am very doubtful. Blood, Money, & Power exposes the secret, high-level conspiracy in Texas that led to President John F. Kennedyâ€™s death and the succession of Lyndon B. Johnson as president in 1963. Attorney Barr McClellan, a former member of L.B.J.â€™s legal team, uses hundreds of newly released documents, including insider interviews, court papers, and the Warren Commission, to illuminate the maneuvers, payoffs, and power plays that revolved around the assassination of Kennedy and to expose L.B.J.â€™s involvement in the murder plot. Oliver Barr McClellan, entrepreneur, counsel and author, born in 1939 in Cuero (aka Rawhide), Texas, became widely known by his 2003 book Blood, Money & Power on the Kennedy assassination. He has also written on globalization. Barr McClellan studied at the University of Texas in Austin. As a student McClellan was a strong supporter of John F. Kennedy. After qualifying as a lawyer he went to work for the administration of President Lyndon B. Johnson. Initially he worked for the National Labor Relations Board but in 1964 he became an attorney for the Federal Power Commission. In 1966 McClellan joined the legal firm of Clark, Thomas and Winters, based in Austin, Texas. At that time the firm was run by the partners Edward Clark, Sam Winters, Don Thomas and Frank Denius. 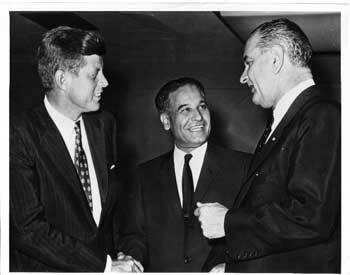 The company was closely associated with Lyndon B. Johnson and the Democratic Party in Texas. McClellan's work included advising on political strategy, campaign contributions, media issues and labour disputes. In 1972 McClellan became a full partner in the legal firm. It was only at this stage that he was told about the illegal activities of the firm. John Cofer explained how the partners dealt with criminal activity: "In short, we helped plan crimes and keep the clients out of trouble." Soon afterwards he discovered that one of the partners, Edward Clark, had been involved in planning the assassination of John F. Kennedy. The assassination of Kennedy allowed the oil depletion allowance to be kept at 27.5 per cent. It remained unchanged during the Johnson presidency. According to McClellan this resulted in a saving of over 100 million dollars to the American oil industry. Soon after Johnson left office it dropped to 15 per cent. In 2004 The Guilty Men was shown on the History Channel. The programme looked at the possibility that Lyndon B. Johnson, Malcolm Wallace and Edward A. Clark were involved in the assassination of John F. Kennedy. 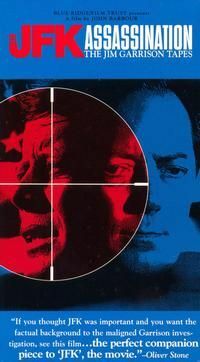 The programme used evidence from McClellan's book Blood, Money and Power: How LBJ Killed JFK. It also used other sources such as the testimony of Madeleine Brown and Billie Sol Estes and the research of Walt Brown, Ed Tatro, Glen Sample, and Gregory Burnham. The Johnson family immediately complained about the programme. Gerald Ford also added his concerns and the History Channel took the decision not to repeat the original broadcast. Haroldson Lafayette "H. L." Hunt, Jr. (February 17, 1889 â€“ November 29, 1974), known throughout his life as "H. L. Hunt," was a Texas oil tycoon and political activist. By trading poker winnings for oil rights, he ultimately secured title to much of the East Texas Oil Field, one of the world's largest oil deposits. From it and his other acquisitions, he accrued a fortune that was among the world's largest; at the time of his death, he was reputed to have the highest net worth of any individual in the world. His personal life, which featured many children by three wives, was among the chief inspirations for the television series Dallas, whose character J.R. Ewing was largely based on popular perceptions of Hunt. The Texas city of Hunt is named after him. A preponderance of evidence points to government involvement in the Kennedy assassination. However, due to the intelligence practice of compartmentalization â€” and the murder and disappearance of key witnesses â€” we will probably never know the exact details of how the government killed not only John F. Kennedy, but also his brother Robert and the civil rights leader Martin Luther King. Billie Sol Estes (January 10, 1925 â€“ May, 2013) was an American businessman; a former financier best known for a business scandal that sent him to jail for fraud multiple times and complicated by his ties to friend and future U.S. President Lyndon Johnson. Estes was living in Granbury, Texas at the time of his death. His body was discovered on May 14, 2013 at his home in deCordova. Estes also alleged in the 1980s that he had inside knowledge that Johnson was involved in the assassination of Kennedy. In 1984, he provided a voluntary statement to a Grand Jury in Texas alleging that the homicide of a key investigator in the Department of Agriculture case was perpetrated by an aide to Johnson, Malcolm Wallace, upon orders from the then-Vice President. When the Department of Justice asked for more information, Estes responded that he would provide information on eight other murders ordered by Johnson, including the assassination of Kennedy, in exchange for immunity from prosecution and a pardon. According to Estes, Johnson set up the assassination in order to become president. They refused. Oh and who was Hagman protraying in "Dallas"?? the one who conspired with Vice Pres Johnson to murder a president? Haroldson Lafayette "H. L." Hunt, Jr. (February 17, 1889 â€“ November 29, 1974), known throughout his life as "H. L. Hunt," was a Texas oil tycoon and political activist. He built one of the world's largest fortunes by trading poker winnings for oil rights, ultimately securing title to much of the East Texas Oil Field, one of the world's largest. Reputed to be the wealthiest person in the world at the time of his death, his many children by three wives inspired the television series Dallas. Madeleine Duncan Brown (July 5, 1925 â€“ June 22, 2002) was born Madeleine Frances Duncan in Dallas, Texas. She was a businesswoman who worked for Glenn Advertising in Dallas. She is noted for her claim to have been the mistress of U.S. President Lyndon Johnson and for implicating Johnson in a conspiracy to kill President John F. Kennedy. Brown said that she met Johnson in 1948, following the death of her husband James Glynn Brown. She went public with the claim of a relationship with Johnson in 1997 â€” a relationship that was considered "an open secret" in Texas. She also said that her son, Steven Mark Brown, was fathered by Johnson. Steven Brown was born December 27, 1950, and died September 28, 1990. On June 1, 1987 Steven Brown filed a $10.5 million lawsuit against the former president's widow, Lady Bird claiming, "My legal birthrights have been violated and a conspiracy was formed to deprive me of my legal heir-ship." Steven Brown died before the case could be settled. In the documentary The Men Who Killed Kennedy, Madeleine Brown and May Newman (an employee of Texas oilman Clint Murchison) both placed FBI director J. Edgar Hoover at a social gathering at Murchison's mansion on November 21, 1963 â€” the night before the assassination of President Kennedy. When they met in California Joe Kennedy, John Kennedy's father, and H.L. Hunt met three days prior to the election â€” they finally cut a deal according to John Currington (an aide to H.L. Hunt) and H.L. finally agreed that Lyndon would go as the vice president ... this came from the horse's mouth way back in 1960 â€” when H.L. came back to Dallas I was walking ... with him ... and he made the remark, "We may have lost a battle but we're going to win a war," and then the day of the assassination he said, "Well, we won the war." Madeleine Brown died on June 22, 2002. Social Security records show the spelling of her name as Madeline F. Brown, and that she died in Dallas, Dallas County, Texas. At stake, according to internal Hill-family documents, is an oil-and-gas fortune worth between $2.5 billion and $4 billion, not to mention such appurtenances as a 50-yard-line box at the Dallas Cowboysâ€™ Texas Stadium, luxury suites for the Dallas Mavericks, Dallas Stars, and Texas Rangers, and a $60 million ski lodge at the base of Vail Mountain. For more than two decades, Iâ€™ve walked a careful line between covering the Hunt family as a newspaper journalist in Dallas and, like many in this city, maintaining friendships with members of the multi-generational and prodigiously tentacled Hunt clan. In 1930, when H. L. Hunt purchased the Daisy Bradford No. 3 oil well, in Rusk County, Texas, and leased the 5,000 acres around it, he locked up control of what turned out to be the largest pool of petroleum in the Lower 48. In time his great wealth would make its way into the hands of 14 acknowledged children. In an era when brash young computer and hedge-fund billionaires seem to earn most of the new money and public attention, itâ€™s hard to recapture the mythic status that the Hunts and their riches once enjoyed. But imagine if Bill Gates, Warren Buffett, Paul Allen, and Larry Ellison were siblings. H. L. Hunt may have been the dynastyâ€™s founder, but the successor generations were in some ways more industrious and imaginative. Bunker Huntâ€™s 1961 discovery of Libyaâ€™s Sarir oil field most likely made him the worldâ€™s richest private individual (on paper, anyway), until the Qaddafi regime nationalized his holdings, in 1973. Lamar Hunt spearheaded the creation of the American Football League. 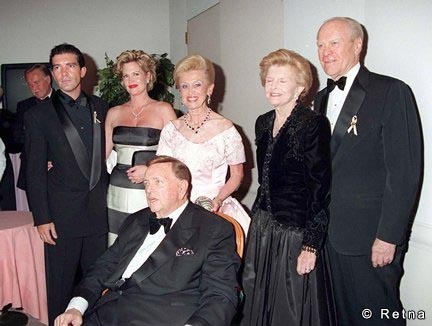 In September 1982, when Forbes magazine published its first list of the 400 wealthiest Americans, the Hunt family claimed 5 of the top 10 spots. Margaret was No. 4, Caroline was No. 5, Lamar was No. 8, Herbert was No. 9, and Bunker was No. 10. In 1983 the family settled into its new headquarters, Thanksgiving Tower, a smoked-glass, 50-story Dallas office building, paid for in cash. 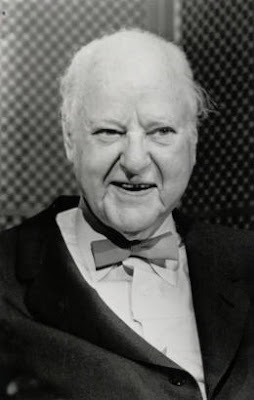 H. L. Hunt was likely the richest American in 1963. His estimated worth was about 5-billion dollars. He was especially interested in preserving the Oil Depletion Allowance and disliked the social programs proposed by the Kennedy administration. He told the gathering of compatriots that the only way to get Communists like the Kennedy brothers out of office is to "shoot 'em out." On November 21, 1963, the evening before JFK's assassination, Joan Crawford attended a Pepsi function in Dallas with Richard Nixon. Conspiracy Theory with Jesse Ventura - JFK Deathbed Confession - E. Howard Hunt's son and the recorded confession he got from his dad on his deathbed. 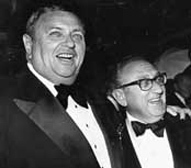 Marvin Davis (pictured here dwarfing pal Henry Kissinger) made his money at the helm of his father Jack's Davis Oil Company. When OPEC put the squeeze on the US in the 70's reducing foreign oil imports, Davis profited enormously from cheap leases he had obtained in the Rockies, Texas and Louisiana. During this period the number of domestic exploratory drillings Davis Oil pursued were only outmatched by Royal Dutch Shell, Amoco and Exxon. In 1981 Davis split the bill with Marc Rich to complete a leveraged buyout of 20th Century Fox but sold the company to Rupert Murdoch four years later. Both men also donated heavily to the presidential campaigns of Bill Clinton, with Davis later forging ahead alone to do major fundraising for Hillary Clinton, Rich being something of persona non grata by that time. March 19 (Bloomberg) -- Nancy Davis, daughter of late billionaire Marvin Davis, alleges her brother Gregg cheated his siblings and mother out of millions of dollars by low-balling the value of the family oil company in a forced bankruptcy sale. Marvin Davis died at 79 in September 2004 with a fortune of $5.8 billion, according to Forbes magazine. In the 1960s, he took control of Davis Oil Co., an earlier family company started by his father, Jack, and became a wildcatter, drilling wells in unexplored areas, particularly in the Rocky Mountains. In 1981 he sold most of his oil and natural-gas holdings for $630 million. Less than four months after Marvin Davis died, his son Gregg began working with Mesdag to arrange a management-led buyout of Davis Petroleum because it needed new capital, according to court papers. Marvin Davisâ€™s widow, Barbara, owned 56 percent and her three daughters and two sons owned 8.8 percent each. Gregg Davis, who lives in Houston, was president of the company and the only family member who was an officer. In her complaint, which doesnâ€™t mention the defaults, Nancy Davis maintains that if her family had known that the buyers were undervaluing the company and its oil reserves, they never would have voted for the bankruptcy plan. â€œGregg Davis misrepresented the true value of Davis Petroleum and created the false appearance of emergency,â€� she alleged in her proposed filing. Marvin H. Davis, a billionaire who amassed his fortune through well-timed deals in the oil and entertainment industries, died Saturday at his home in Beverly Hills, Calif., a family spokesman said. He was 79. Mr. Davis was born on Aug. 31, 1925, in Newark, the son of Jack and Jean Spitzer Davis. His family history seemed part legend, friends said. His father immigrated from London and sold ready-to-wear dresses in New York City. Mr. Davis often told friends that his father had been a stowaway and a failed prizefighter. "Some of Marvin's stories were better stories than they were fact," Mr. Kneser said. Mr. Davis's family later moved to Colorado, where he and his father made money buying low-priced oil and gas leases throughout the Rocky Mountains and then doing extensive drilling. Mr. Kneser said Mr. Davis had been a pioneer of the oil deal known as the "third for a quarter," where an oil prospector insulates himself from risk by selling one-quarter of a well for one-third of the price of the well. Essentially, he drilled his own wells with other people's money. He also became a major real estate developer in Denver, acquiring a huge shopping center and office complex. In 1981, Mr. Davis sold most of his oil holdings for $600 million to the Canadian company Hiram Walker-Consumers Home Ltd. He then turned his eye toward Hollywood and, with Marc Rich, the financier later pardoned by President Bill Clinton, bought 20th Century Fox for $725 million. Newspaper and magazine articles estimated that Mr. Davis made $325 million when he sold to Mr. Murdoch in 1985. He also made hundreds of millions in profits when, in 1990, he sold Pebble Beach for $841 million. But Mr. Davis's career was marred by accusations of wrongdoing over the years. The Justice Department accused one of his companies of violating federal oil-pricing policies. The case was settled in 1981, with Mr. Davis paying a $20,000 fine. Business partners accused him in civil lawsuits of inflating the results of his oil wells. In Hollywood, he took to the notability attached to running a major studio. He named former President Gerald R. Ford and Henry A. Kissinger to the board of Fox, helped guide his son John into the entertainment business and played host at lavish parties for the studio. Mr. Kneser said that Mr. Davis had been plagued by health problems since 1990, but that he and his wife remained fixtures in Beverly Hills social circles. They raised money for diabetes research and had a lavish annual party called the Carousel Ball. In addition to his wife, Mr. Davis is survived by three daughters, Patricia Ann Davis Raynes, Nancy Davis Rickel and Dana Davis; two sons, John Davis and Gregg Davis; and his sister, Joan Chorney. 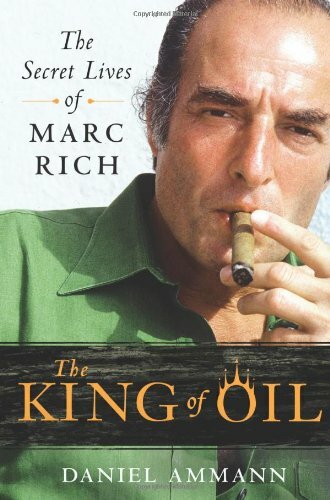 The downside of this book is that it doesn't reveal "how" Marc Rich won crucial contracts, established relationships and competed with other commodity traders. Perhaps it's too hard to reconstruct the deal-making conversations, but it would be interesting to hear the inside stories of those critical turning points in his career. Marc Rich (born December 18, 1934) is an international commodities trader. He was indicted in the United States on federal charges of illegally making oil deals with Iran during the late 1970s-early 1980s Iran hostage crisis and tax evasion. He was in Switzerland at the time of the indictment and has never returned to the U.S.
Rich has been credited with having created the spot market for crude oil in the early 1970s, revolutionizing commodity trading. His tutelage under Philipp Brothers afforded Rich opportunities to strike deals with various dictatorial rÃ©gimes and embargoed nations, such as Iran, using a special relationship with Ayatollah Khomeini, the leader of the 1979 Iranian Revolution which saw the overthrow of Mohammad Reza Pahlavi, the Shah of Iran. Despite the American embargo, Iran would become Rich's most important supplier of crude oil for more than 15 years. He earned billions selling oil for the Iranian ayatollahs. In May 2007 Rich received an honorary doctorate from Bar Ilan University, Ramat Gan, Israel, in recognition of his contribution to Israel and to the university's research programs. He received the same honor from Ben-Gurion University of the Negev, Beersheba, Israel, on November 18, 2007. The Chaim Sheba Medical Center at Tel Hashomer in suburban Tel-Aviv, Israel, honored Rich with the "Sheba Humanitarian Award 2008". Former recipients of this award include actor Michael Douglas, actress Elizabeth Taylor and former U.S. President Gerald R. Ford. His company, Marc Rich Real Estate GmbH, is involved in large developer projects (e.g., in Prague, Czech Republic). Rich was also accused of being involved with the Bank of Credit and Commerce International BCCI. It begins about the origins of metal trading and goes directly to writing about the people who learned it, changed it and became successful than any other's dreams in the persona of, Marc Rich And Pincus Green. It will explain how commodities works, trading in them is accomplished and the ability to go from Mail Rooms to Board Rooms because of hard work, smarts and guile to do it. The book explains how oil was once controlled by the "Seven Sisters Oil Companies (Exxon, Mobil, BP, Shell, Gulf, Chevron and Texaco), who have since merged among themselves. Everything about the product from ground to shipping to refining to market was dominated by them until Marc Rich and Pinky Green. This is just a portion of what the book is about with facts too real for fiction. Mr. Rich and Green built over a 30 billion dollar business in over 125 countries and is the true multi-national that the world have come to know today. FURST HANS ADAM is the owner of the super-secret tax haven bank LGT - BANK IN LIECHTENSTEIN. The Prince recently appointed his grandson PRINCE MAXIMILLIAN as the new Chairman of the Board of LGT BANK.. The "SWISS BILLIONAIRES LIST" 2011 Edition indexes 144 swiss billionaires. The information includes the office addresses and office telephone numbers of the 144 swiss billionaires, which is the most secretive index to SWISS BILLIONAIRES. all of whom are SWISS BILLIONAIRES. The COST of the 2011 Edition of the "SWISS BILLIONAIRES LIST" is $100,000. The king of commodities has lived in Zug since 1983. Marc Rich was born in 1934 to a Jewish family who emigrated to the USA during the war. At the age of 20, he was hired by Phillips Brothers, a top global commodities trader, and then founded his own company in 1973, Marc Rich & Co. He invented spot oil trading, and reaped his first billion in profit during the second oil crisis of 1979. Wanted by the American justice system for having traded with Iran and for tax evasion, Marc Rich sought exile in Switzerland in 1983. He set up his head office in Zug, where taxes are the lowest in Switzerland. Marc Rich created the Doron Foundation, which supports such institutions as the Zurich Opera, the Internal Festival of Lucerne and the ZugHockey Club. The business man's fortune stands in fact at over 2 billion Swiss francs. He lives in La Villa Rose, a mansion on the shores of Lake Lucerne, in Meggen, not far from Lucerne. Marc Rich also owns a home in Marbella, Spain, and a chalet on the slopes of St. Moritz, only a few minutes by helicopter from his villa. Sentenced to 325 years in prison by the American justice, Marc Rich was pardoned by Bill Clinton at the end of 2000. In February, 2001, his firm Marc Rich & Co. merged with Crown Resources, which also has its head office in Zug. According to the president's secretary, Evelyn Lincoln, Kennedy had decided that because of this emerging scandal he was going to drop Lyndon B. Johnson as his running mate in the 1964 election. 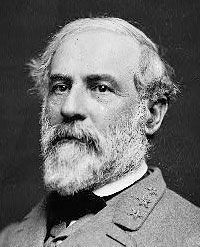 He told Lincoln that he was going to replace Johnson with Terry Sanford. On 22nd November, 1963, a friend of Baker's, Don B. Reynolds told B. Everett Jordan and his Senate Rules Committee that Johnson had demanded that he provided kickbacks in return for this business. This included a $585 Magnavox stereo. Reynolds also had to pay for $1,200 worth of advertising on KTBC, Johnson's television station in Austin. Reynolds had paperwork for this transaction including a delivery note that indicated the stereo had been sent to the home of Johnson. Don B. Reynolds also told of seeing a suitcase full of money which Baker described as a "$100,000 payoff to Johnson for his role in securing the Fort Worth TFX contract". His testimony came to an end when news arrived that President John F. Kennedy had been assassinated. As soon as Lyndon B. Johnson became president he contacted B. Everett Jordan to see if there was any chance of stopping this information being published. Jordan replied that he would do what he could but warned Johnson that some members of the committee wanted Reynold's testimony to be released to the public. On 6th December, 1963, Jordan spoke to Johnson on the telephone and said he was doing what he could to suppress the story because " it might spread (to) a place where we don't want it spread." On 10th May, 1965, Baker's secretary, Nancy Carole Tyler, died in a plane crash, near Ocean City, Maryland,. Her roommate, Mary Jo Kopechne, died in road accident when a passenger of a car driven by Edward Kennedy. Robert Gene Baker (born November 12, 1928, in Pickens, South Carolina) is a former political adviser to Lyndon B. Johnson, and an organizer for the Democratic Party. 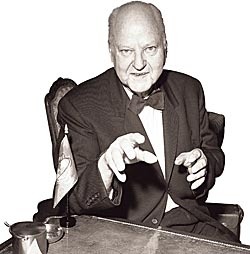 During 1962, Baker established the Serv-U Corporation with his friend, Fred Black. The company was designed to provide vending machines for companies working for federally granted programs. Though a part of numerous other deals involving both politics and private financial affairs, this particular business venture would cause a scandal. The Serv-U Corporation deal became the subject of allegations of conflict of interest and corruption after a disgruntled former government contractor sued Baker and Black in civil court. This lawsuit eventually generated a great deal of press. According to author Evan Thomas, the President's brother, Attorney General Robert Kennedy, was able to arrange a deal with J. Edgar Hoover to quell mention of the Rometsch allegations in the Senate investigation of Bobby Baker. Hoover successfully limited the Senate investigation of Baker by threatening to release embarrassing information about senators contained in FBI files. In exchange for this, Robert Kennedy reassured Hoover that his job as FBI Director was secure and also reluctantly agreed to allow the FBI to proceed with wiretaps that Hoover had requested on Martin Luther King to try and prove King's close confidants and advisers were communists. Early Days of Clint Murchison Sr. The small, sleepy town of Athens, Texas (pop. 5,300) has the enviable reputation of producing more millionaires per capita than any other place in the U.S., but, unlike most small towns whose local sons have gone away to make good, the rich ex-Athenians can't stay away. No matter how big they become, the handful that has earned Athens its reputation is helplessly drawn back by the lure of a few days' "brim fishin' " at the Koon Kreek Klub (opposite)â€”an angler's paradise which, though peopled by millionaires, has managed to remain as cultivatedly unpretentious, in a luxurious way, as its members. Among the old Athens residents who can never stay away for long when the bream (pronounced brim) are biting at Koon Kreek are Clinton Williams Murchison and his oilman crony Sid Richardson, who are firmly convinced that there is no other kind of fishing. Like its members, Koon Kreek does, of course, have its little luxuries...such as guides to bait the members' hooks and remove the fish therefromâ€”"gives a man time to do a little figuring," Murchison explainsâ€”but a stranger coming upon the club in the east Texas wilderness might mistake it for the summer headquarters of the Salvation Army. This suits Clint and the other Koon Kreekers fine. There he and Richardson and such close-knit Athenians as Oilmen Ike LaRue and George Greer spend many a weekend just loafing around the place in old clothes, playing a wild Athenian version of gin rummy, doing a little drinking and a lot of fishingâ€”for bream, of course. The club was founded in 1901 when gentlemen anglers from Dallas would drive the 75 miles to Athens by horse and buggy for a weekend's sport. Members who have fished around the world maintain against all comers that Koon Kreek has the best fishing in the world. Teddy Roosevelt was entertained there often, although his cousin Franklin, said a founding father recently, could never get in the front door. ... the film didn't air on U.S. network television until 1975, when a youthful Geraldo Rivera debuted the footage on ABC's Good Night America. Bob Groden debuts the extant Zapruder film on Geraldo Rivera's "Good Night America" show in March, 1975. Although the film was showed to the courtroom at the Clay Shaw trial in 1969, this was the first widespread public showing of the film. The film's appearance on this show led to the creation of the House Select Committee on Assassinations two years later. New US AirCraft Carrier Named After Globalist President. Earl Warren and members of the Warren Commission present completed Report to President Lyndon Baines Johnson on September 24, 1964. 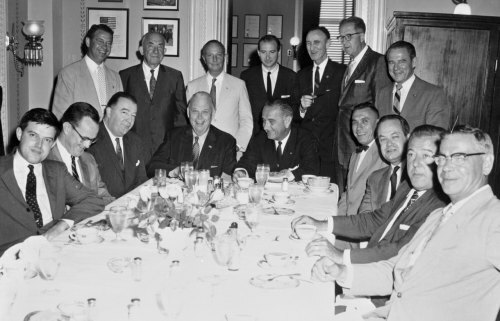 In the photo are (left to right): John McCloy, J. Lee Rankin (General Counsel), Senator Richard Russell, Congressman Gerald Ford, Chief Justice Earl Warren, President Lyndon Johnson, Allen Dulles, Senator John Sherman Cooper, and Congressman Hale Boggs. on the place where a bullet entered John F. Kennedy's body when he was killed in Dallas. Gov. John Connally - a crucial element in its finding that Lee Harvey Oswald was the sole gunman.